James Harold Cappelli, 94, of Fishers, IN and formerly of Ft. Wayne, IN, died February 4, 2018. He was born at Detroit, Michigan to William and Mary (Kehn) Cappelli. After his schooling he proudly served his country during WW II in the U.S. Army Air Corps. Moving to Ft. Wayne, he became the owner of United Vacuum Store and J & J Antiques. Jim, as he was fondly known, had a love for antiques, and enjoyed hunting and fishing. After retirement he moved to Noblesville, Indiana where he attended Hazel Dell Christian Church. He married Jeanne Maree (Mosbaugh) Cappelli on March 15, 1977 who survives him. Also surviving are sons: William (Claudia) Cappelli and Carl Cappelli both of Ft. Wayne, step-daughter: Martha (Larry) Johnson of Decatur, IL, son-in-law: Timothy Nichols, 16 grandchildren and many great-grandchildren. 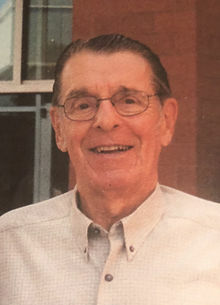 In addition to his parents he was preceded in death by his first wife: Jean Cappelli in 1974, son: Gary Cappelli, daughter: Debbie Cappelli Nichols, stepdaughter: Donna Trigilio and brother: Eugene Cappelli. Funeral services will be held at 11:00 A.M. Tuesday, February 13, 2018 at Hartley Funeral Homes Cicero Chapel, 209 West Jackson Street, Cicero, IN 46034 with visitation from 10:00 A.M. until time of the services. On Wednesday, February 14, 2018 services will be held at 12:00 Noon in the Chapel at Lindenwood Cemetery at Ft. Wayne, IN with visitation from 11:00 A.M. until time of the services. Burial will follow the services. You may send condolences at www.hartleyfuneralhomes.com.